"Highly recommended. Lower-division undergraduates through faculty." Described as "one of the most vulgar forms of barbarism," by Rep. John Kasson (R-IA) in 1882, a series of laws passed by the United States Congress between 1879 and 1943 resulted in prohibiting the Chinese as a people from becoming U.S. citizens. Forbidden Citizens recounts this long and shameful legislative history. "In other cases, we admit the people and exclude the individual. In the Chinese case, we admit the individuals and exclude the people." The most notorious of these laws was popularly known as the Chinese Exclusion Act of 1882. But the Act was no isolated measure passed by Congress in a weak or misguided moment. Controversial when first proposed, Chinese exclusion rapidly became consensual--and Congress continued to tighten the policy. Using senators' and representatives' own words, this book chronicles the sad and disturbing legislative history of the Chinese exclusion laws, with many passages transcribed from the actual debates. The appalling racism that permeated Congress becomes all too clear. Unfortunately, these vicious remarks were neither isolated nor atypical. However, the story really begins with the 1870 debate over naturalization rights, set out in Chapter One. But for a Senate filibuster led by Nevada's William Stewart, legislation very likely would have passed to grant legal Chinese immigrants a path to citizenship. As Stewart himself later proclaimed, had the Chinese become voters, there would have been no exclusion policy. In these years, China was poor, backward, and generally unstable. As Congress implemented Chinese-American treaties, or legislated around them, it did not pay China's wishes much heed. The Dynasty was finally overthrown by the republican revolution movement late in 1911. The United States entered the Pacific war in 1941, following the Japanese attack on Pearl Harbor. China and America allied to oppose a common Japanese enemy. Repeal of the exclusion laws in 1943 was a war measure, undertaken by President Franklin Roosevelt and Congress to bolster America's Chinese ally. The exclusion story is unfamiliar to most Americans, especially those not of Asian heritage. Freed from the burdens of these unjust laws, Chinese-Americans have prospered in the United States. A people Congress claimed couldn't assimilate have assimilated so well that it's hard to find the evidence of past discrimination against Chinese in America. Chinese-Americans have been leaders in business, the professions, sports, and the performing arts. And they've worked in the top ranks of American government. In the executive branch, Elaine Chao broke ground, serving as secretary of labor (2001-2009) for President George W. Bush. Gary Locke was the first Chinese-American to be chief executive of an American state, as the twenty-first Governor of Washington (1997-2005). Locke later served as secretary of commerce and then Ambassador to the People's Republic of China. Senator Hiram Fong (R-HI), a senator from 1959 to 1977, was the pioneering Chinese-American on Capitol Hill. Elected in 2009, Representative Judy Chu (D-CA) is the first Chinese-American woman to serve in either chamber of Congress. Such success stories notwithstanding, the experience of early Chinese immigrants was uncommonly difficult because of legal discrimination against Chinese. The distress Congress caused for multiple generations of Chinese--those who were directly affected as well as their families--is still real. Shedding light on the past helps to ensure that such miscarriages do not recur. For a more thorough discussion of the legislative procedures used in Congress, please see the Congressional Deskbook, also published by TheCapitol.Net. 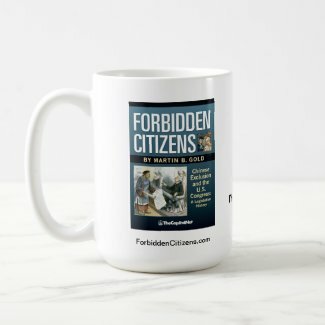 This book's web site, ForbiddenCitizens.com, contains numerous links to additional information about the people, events, timelines, and other publications discussed herein, plus links to political cartoons from the era. 1.20 Senate Debate, July 2, 1870: "A requirement disgraceful to this country"
1.30 Senate Debate, July 4, 1870: "They do not value the privileges of citizenship"
2.10 House Debate, January 28, 1879: "The most debased people"
2.21 Senate Debate, February 12, 1879: "Their sordid, selfish, immoral, non-amalgamating habits"
2.22 Senate Debate, February 13, 1879: "An indigestible element"
2.23 Senate Debate, February 14, 1879: "Wholly unfit to become citizens"
2.26 Senate Debate, February 15, 1879: "The brightest act of my life"
2.40 A Presidential Veto: Rutherford Hayes: "Strangers and sojourners"
3.20 Senate Debate, February 28, 1882: "A confession of American imbecility"
3.30 Senate Debate, March 1, 1882: "To shame, to weakness, and to peril"
3.40 Senate Debate, March 2, 1882: "Swarm upon us like locusts"
3.50 Senate Debate, March 3, 1882: "Dregs of the countless hordes of China"
3.60 Senate Debate, March 6, 1882: "Will not assimilate"
3.70 Senate Debate, March 7, 1882: "An irrepressible conflict between them"
3.80 Senate Debate, March 8, 1882: "A storm of condemnation"
3.90 Senate Debate, March 9, 1882: "Fifty million sovereigns can be despotic"
4.10 House Debate, March 14, 1882: "Plant a cancer in your own country"
4.20 House Debate, March 15, 1882: "No more regard for his oath"
4.30 House Debate, March 16, 1882: "The repulsive specter of Asiatic squalor"
4.40 House Debate, March 18, 1882: "This exhaustless stream of yellow plague"
4.50 House Debate, March 21, 1882: "The assimilation of oil and water"
4.60 House Debate, March 22, 1882: "Who would have them for voters?" 4.70 House Debate, March 23, 1882: "The most hideous immoralities"
4.80 A Presidential Veto: Chester Arthur: "A breach of our national faith"
4.90 Senate Veto Override Debate, April 5, 1882: "Will not disgrace our statute books"
5.10 House Debate, April 17, 1882: "A pack of hounds to hunt down any race"
5.20 Senate Debate, April 25, 1882: "A subject of deep respect and repentance"
5.30 Senate Debate, April 26, 1882: "Beyond the realm of political agitation"
5.40 Senate Debate, April 27, 1882: "They are parasites"
5.41 Lue Gim Gong, "The Citrus Wizard"
5.50 Senate Debate, April 28, 1882: "A most degraded corruption"
6.10 House Debate, May 3, 1884 (H.R. 1798): "This is a white man's government"
6.20 Senate Debate, July 3, 1884: "Will repent in sackcloth and ashes"
7.10 Senate Debate, January 12, 1888: "Polluted with the curse of human slavery"
7.20 Senate Debate, March 1, 1888: "The world was created wrong"
7.40 House Proceedings on the Implementation Bill (S. 3304): "The hideous Mongolian incubus"
7.41 Senate Concurs in the House Amendment, and China's Reaction: "A response of outrage"
7.51 House Debate, September 3, 1888: "The truth is a merchantable commodity"
7.52 Senate Debate, September 3, 1888: "Deport every single one of them"
7.53 Senate Debate, September 4, 1888: "An inferior race"
7.54 Senate Debate, September 5, 1888: "Homogeneity in races"
7.55 Senate Debate, September 6, 1888: "A cruelty and an outrage"
7.56 Senate Debate, September 7, 1888: "Stop this ulcer"
7.57 Senate Debate, September 10, 1888: "China is our great friend"
7.58 Senate Debate, September 11, 1888: "The evil will go on increasing"
7.59 Senate Debate, September 13, 1888: "That seething, roaring, blood-curdling curse"
7.62 House Debate, September 20, 1888: "A demagogical way to make some capital"
8.10 House Debate, April 4, 1892: "An absolute abrogation"
8.21 Senate Debate, April 21, 1892: "Goes far beyond any bill"
8.22 Senate Debate, April 22, 1892: "A harsh proceeding"
8.23 Senate Debate, April 23, 1892: "A very shrewd people"
8.24 Senate Debate, April 25, 1892: "Intense feeling of antagonism"
8.30 Bicameral Agreement: Conference Report: "One credible white witness"
8.31 Senate Debate, May 3, 1892: "He does not stand like an ordinary person"
8.32 House Debate, May 4, 1892: "The old slavery days returned"
9.10 Senate Debate, April 4, 1902: "One of the great policies of our country"
9.11 Senate Debate, April 5, 1902: "Amplest assurance of American friendship"
9.13 Senate Debate, April 7, 1902: "Obnoxious social conditions"
9.14 Senate Debate, April 8, 1902: "They came like locusts"
9.18 Senate Debate, April 9, 1902: "Narrow, bigoted, intolerant, and indefensible"
9.19 Senate Debate, April 10, 1902: "The Chinese must be kept out"
9.20 Senate Debate, April 12, 1902: "Mere question of legislative detail"
9.23 Senate Debate, April 15, 1902: "Ruthlessly disregards treaty rights"
9.24 Senate Debate, April 16, 1902: "If I stand alone"
9.30 House Debate, April 4, 1902: "Largely a Pacific question"
9.31 House Debate, April 5, 1902: "To arouse this sleeping five-toed dragon"
9.32 House Debate, April 7, 1902: "Clearly unconstitutional"
10.20 Senate Debate, April 22, 1904: H.R. 15054: "There would have been great trouble"
11.30 H.R. 3070 and House Debate, October 20, 1943: "Important in the cause of winning the war"
11.40 H.R. 3070 and House Debate, October 21, 1943: "Face is not just oriental"
11.52 Senate Debate, November 26, 1943: "The white man feared the onrush of the yellow man"
Find Forbidden Citizens in a library near you. "[L]andmark volume on the subject of exclusionary policies against Chinese and Chinese Americans ... a valuable teaching tool ... an exemplary subject reference." Anti-Chinese violence, discrimination, and rhetoric have a long, sordid history in America. It began with the first Chinese immigrants to North America in the 1840s and in some ways, at least rhetorically, continues to the present day. 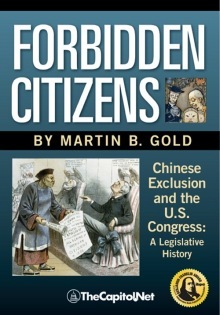 The anti-Chinese movement often took a federal political form that proved amazingly complex; and for the first time this legal history has been carefully and thoughtfully explained in Forbidden Citizens, from the initial congressional debates in the 1870s, through the passage of no less than nine Chinese exclusion laws, to the eventual repeal of fourteen statutes in 1943. All can be found in this one volume. It is a monumental achievement." Beginning with the Chinese Exclusion Act in 1882, these laws were the first time in our nation's history that Congress expressly singled out a group of immigrants for denial of citizenship rights, and for special exclusion under its immigration laws. But, as to the latter course, it was certainly not the last. There is a straight line from the enactment of the exclusion laws to the exclusionary immigration laws of the 1920s that effectively sealed the doors of the United States to Jews who might otherwise have been able to flee the conflagration of Nazi-occupied Europe. We do well to remember that the protection of the rights of any of us depends on protecting the rights of all. 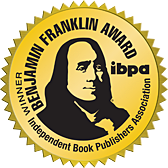 Gold's book is a stirring and timely reminder of that principle."